Smart children's ties with themed motifs. Also plain ties for younger children and toddlers. We have had the following motif children's ties especially made for young boys and girls. They are approximately 44 inches in length (all tie - no elastic!) with a blade of 3 inches. Each tie has stitched motif detail. These are great for eventing, sporting or just for fun. They are hard wearing and look very smart. We are pleased to be able to say that these ties are completely manufactured within the United Kingdom from weaving the material at the mill to cutting and sewing the material to make up the tie. 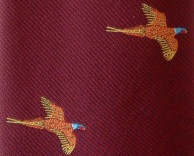 Smart children's tie with an embroidered partridge motif. Children's Tie with horse heads, horseshoe and whip on a plain tie. Children's tie with cycling theme. Plain ties for the younger child.